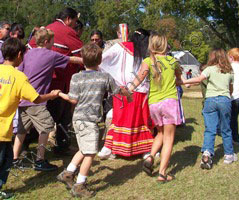 Friendship Dance at Moundville, Alabama helps build relationships. The running theme through my life of late (in business and personal situations) revolves around relationships. It is not just whom you know, but how you know them and how you choose to foster that knowing. Six degrees of separation – or even one or two – will not give me the desired effect that I want. It is only when I invest in the knowing that I grow the relationships to something more than a nod in passing. Building relationships requires that I move beyond my selfish requirements. I have to be willing to expose my heart (at least to some degree) if I am to build any kind of honest foundation. I have to be willing to give up my time and that to-do list at some point. I have to be willing to put others before my own desires. What I can get from what I give is more than anything I would have had otherwise. If I push self out of the way and foster that relationship. Online groups – several years ago, I joined some online forums to “build my platform.” I ended up building some relationships that have supported me and comforted me during some of the toughest times I have faced – from the tornadoes of April 2011 to my mom’s death in March of 2012. These folks, through the ChristianWriters and CIA (Christian Independent Authors), were more than just an online presence when things got tough. Today, they are pushing me to continue pursuing the success I desire in my writing. Online groups can be more than phantoms over the waves of the World Wide Web – IF I am willing to invest in the relationships. Regional Groups – In 2009, I discovered a website of all Alabama Bloggers. There was no rhyme or reason to the ones in the group other than the geographical location, but I jumped on board. I wrote some articles for the site. I linked to the site. And then I forgot all about the site. It was just another blog in my list of “blogs I need to visit.” This year, I have reconnected with the Alabama Bloggers (thanks in a large part to another blogging group). I am attending face-to-face meet ups and visiting the blogs of those Alabama bloggers that I have the chance to meet. Through these meet-ups and through the blog and Facebook page, I am learning from these other bloggers and getting the encouragement to continue pushing forward with my own writing desires. These regional groups are more than just people who live in the same area – IF I am willing to step out and connect with the people at the other side of the groups. Facebook (and other social media) – It seems that almost everything I have done is about building my platform. At least, I think that is why I do what I do. Soon I discover, like with Facebook, that when the sites are used correctly they have a purpose beyond what I expected. I have had the opportunity to connect with people all around the globe that I might never have had the opportunity to meet – because of the technology offered through these social media. It was a Facebook group, Rocket City Bloggers, that helped me reconnect with the Alabama Bloggers and other great groups (thanks to Carol Marks for keeping me on my toes). No matter how hectic times may feel, it is possible to connect with real people. Use the internet to build new connections and possibilities or to set up face-to-face gatherings. Reach out. Connect. Build relationships and you will find that through relationships it all gets a little easier. Do you find it difficult to build relationships? What are you doing to overcome the challenges we face?